Consider a situation where we have a set of intervals and we need following operations to be implemented efficiently. 3) Given an interval x, find if x overlaps with any of the existing intervals. Interval Tree: The idea is to augment a self-balancing Binary Search Tree (BST) like Red Black Tree, AVL Tree, etc to maintain set of intervals so that all operations can be done in O(Logn) time. Every node of Interval Tree stores following information. b) max: Maximum high value in subtree rooted with this node. The low value of an interval is used as key to maintain order in BST. The insert and delete operations are same as insert and delete in self-balancing BST used. The main operation is to search for an overlapping interval. Following is algorithm for searching an overlapping interval x in an Interval tree rooted with root. 1) If x overlaps with root's interval, return the root's interval. 3) Else recur for right child. How does the above algorithm work? Let the interval to be searched be x. We need to prove this in for following two cases. Case 1: When we go to right subtree, one of the following must be true. a) There is an overlap in right subtree: This is fine as we need to return one overlapping interval. b) There is no overlap in either subtree: We go to right subtree only when either left is NULL or maximum value in left is smaller than x.low. So the interval cannot be present in left subtree. Case 2: When we go to left subtree, one of the following must be true. a) There is an overlap in left subtree: This is fine as we need to return one overlapping interval. b) There is no overlap in either subtree: This is the most important part. We need to consider following facts. …. max in left subtree is a high of one of the intervals let us say [a, max] in left subtree. …. Since x doesn’t overlap with any node in left subtree x.low must be smaller than ‘a‘. …. All nodes in BST are ordered by low value, so all nodes in right subtree must have low value greater than ‘a‘. …. From above two facts, we can say all intervals in right subtree have low value greater than x.low. So x cannot overlap with any interval in right subtree. Following is C++ implementation of Interval Tree. The implementation uses basic insert operation of BST to keep things simple. Ideally it should be insertion of AVL Tree or insertion of Red-Black Tree. Deletion from BST is left as an exercise. // Else, new node goes to right subtree. cout << "[" << root->i->low << ", " << root->i->high << "]"
Interval tree is mainly a geometric data structure and often used for windowing queries, for instance, to find all roads on a computerized map inside a rectangular viewport, or to find all visible elements inside a three-dimensional scene (Source Wiki). Both segment and interval trees store intervals. 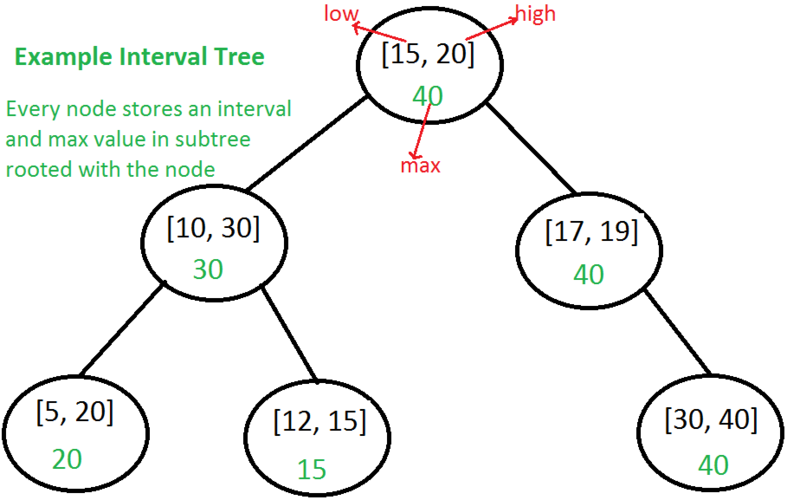 Segment tree is mainly optimized for queries for a given point, and interval trees are mainly optimized for overlapping queries for a given interval. 1) Implement delete operation for interval tree. 2) Extend the intervalSearch() to print all overlapping intervals instead of just one.